The fierce showdown over retirement reform in France entered what appeared to be a decisive phase on Friday, Oct. 22, as riot police moved in to break up a strike at an oil refinery outside Paris less that 24 hours after President Nicolas Sarkozy employed combative language in a pledge to see his pension revision to term. The action appeared to signal the government's view that key factors in the confrontation had turned in its favor, allowing it to mount an offensive push toward victory in both Parliament and the streets. 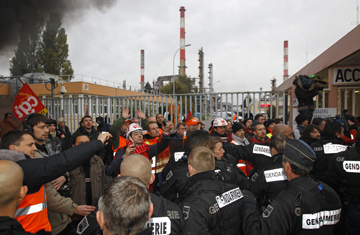 Unions said three employees of the Grandpuits refinery east of Paris were injured when police moved in at around 9 a.m. to clear the blockade that strikers have maintained for the past 10 days. The barricade was one of a dozen that had largely shut down France's refineries, producing gas shortages across the country that Sarkozy vowed on Thursday to resolve. The demonstrators' choke hold on gas supplies had become a strategic element in the widespread opposition to plans to revise France's deficit-plagued pension scheme by increasing the minimum retirement age from 60 to 62, the age to collect full benefits from 65 to 67, and the length of time an employee is required to pay into it by one year to 41.5. A large majority of French have resisted the initiative as unfair and have launched rolling strikes and enormous, at times violent demonstrations since early September. With protesting students in several French cities continuing to battle police and engaging in acts of vandalism on a daily basis, Sarkozy on Thursday warned he'd put a stop to all insurrectionist forms of opposition. "There are many ways to express yourself in our democracy, but violence is the most cowardly, the most gratuitous, and it is not acceptable," a tense Sarkozy said during a meeting with local officials in central France on Thursday, referring to students who've clashed with police around Paris, in central Lyon and in scores of other cities over the past week. "These thugs will not have the last word in a democracy. They will be arrested, found and punished." Sarkozy didn't stop there, issuing a similar warning to striking workers at refineries  and presumably anywhere else  whose protests "take hostage innocent people trying to go about their daily business." "They will destroy jobs," the President said of the protesting refinery workers, foreshadowing Friday's police intervention. "A business that has no more gas, that gets no more deliveries, will close. It's the little people who will pay the price." Over previous weeks of protests, Sarkozy had largely limited his response, simply accelerating the final legislative passage of his reform. So why the sudden swagger? One big reason is a ritual almost as central to French life as strikes: vacations. The government is banking that the nearly two-week-long school break that begins Oct. 23 will disperse students to far-flung holiday destinations and rob the movement of its most dramatic component. Meanwhile, though unions voted on Oct. 21 to hold two more days of demonstrations, on Oct. 28 and Nov. 6, it seems likely that the disputed reform proposal will have already been passed into law by then, making continued opposition a purely symbolic (though politically significant) act. The legislation is now expected to be approved in coming days and signed into law by Sarkozy in early November. There are other reasons for Sarkozy's change in strategy. Labor action that had disrupted much rail, air and municipal transportation following the last big demonstrations, on Oct. 19, has since mostly faded. That means the refinery blockades  which had left 20% to 30% of French gas stations dry  were the last main pressure point unions had awaiting their next scheduled show of force, on Oct. 28. By using police to free up the Grandpuits refinery  likely just the first such intervention in the next few days  Sarkozy can position himself as the man who not only drove his pension reform through but also stood up to the most defiant elements of opposition to boot. This strategy carries risks, however. First off, new polls on Friday show that 69% of respondents support the opposition and the strike movement. That means that despite the disruptions the protests have caused, the French public presumably won't approve of heavy-handed moves like Sarkozy's refinery intervention to thwart strikes. "What President, what Parliament passed a law banning workers' constitutional right to strike?" Charles Foulard, head of the Confederation of French Labor union at Grandpuits, asked on TV channel i-Tele Friday morning. "It's an outrage, and the anger here will drive our future action." Which is the other risk. In response to Sarkozy's end-around action, infuriated union workers and students may decide to radicalize their protests and surge out of the control of their leaders  a scenario long feared by observers. But even if the movement simply peters out once the reform becomes law, public resentment of the reform  and the way Sarkozy rammed the measure through  may yet cost him dearly, with his own re-election rendezvous with voters just 18 months off. See why the French love to strike.